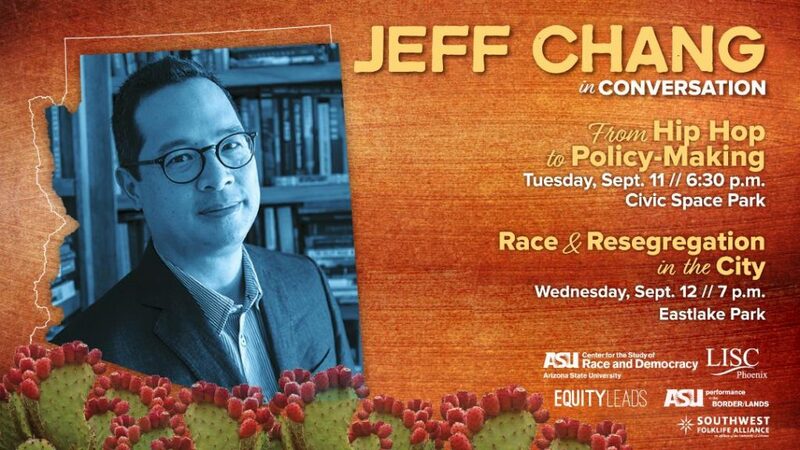 Join author and arts activist, Jeff Chang, back to Arizona to work with arts leaders and community organizers in asking: What is the role of artists and arts institutions in advancing racial and social justice in Arizona? Mr. Chang will convene with a dynamic group of cultural workers and community organizers to imagine a more equitable future for arts in Arizona. This visit is grounded by his most recent book, We Gon’ Be Alright: Notes on Race & Resegregation (2016), a look at the current cultural challenges facing our nation. In this visit, we have centered the critical cultural and artistic leadership of women of color and communities of color who use art to impact radical social change in the borderlands. We invite you to join the conversation. Join the Hip Hop Cluster and the Center for the Study of Race and Democracy for a performative panel discussion and movement facilitation on the relationship between art, social impact and public policy using hip hop as a lens for social transformation. Register. Join LISC Phx and InSite Consultants as they host a public panel with community organizers and leaders to discuss the continued impact of race and resegregation along the south Phoenix light rail and the opportunities to reimagine a more equitable development model. Register. A program of Performance in the Borderlands, the Center for the Study of Race & Democracy, and Southwest Folklife Alliance.